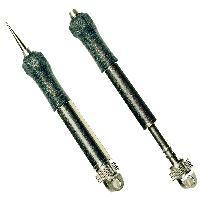 Stonfo Hook Eye Cleaning Tool a useful tool for cleaning the eye of a hook or picking out knots from nylon etc. 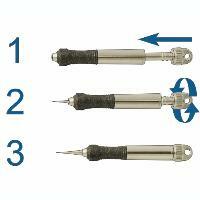 The Stonfo hook eye cleaning tool has a retractable stainless steel needle with double conicity and soft touch handle. Stonfo Hook Eye Cleaning Tool, just one of a huge range of Fly Tying & Fly Fishing Equipment that troutcatchers has in stock for quick and easy delivery. Fantastic product. Another great product from Stonfo. Nice item and great service. Very effective and great for us who find it absolutely impossible to do things just armed with a sharp needle and stiff arthritic fingers. This is a fantastic tool. every angler should have one! quality a very good tool for an ageing guy like myself easy to use and safely tucked away when not in use, saves all the hassle of using a hook or another fly to clean excess varnish from fly eyes. very neat and functional way of avoiding stabbing yourself when not in use. Like the rubber grip (handy when my fingers are cold). Possiibly a gadget for the fisherman who has everything, but it''s way easier to use than another fly to clear a hook eye that''s clogged with varnish when you''re stood in a river. A spring catch would be better than the twist lock, making it one handed, but very useful nonetheless. Recommended!